A sweet gown for little boys by Delaney perfect for new baby gowns, take me home gowns, baby shower gifts and new baby pictures. 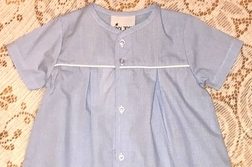 It is made with a soft light blue tiny check fabric and has a rounded collar. 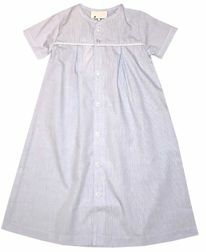 The gown buttons fully down the front and is piped across the chest with white fabric. If you choose a monogram, it is done on the baby's left chest side.